Yesterday’s film ‘Sylvie et le fantôme‘ proved to be the perfect warm-up for Guillermo del Toro’s ‘Crimson Peak’ (2015). “Ghosts are real” says a young girl in the opening scene of the film. Shortly afterwards her dead mother returns in the most nightmarish way and warns her in no uncertain terms to beware of Crimson Peak. No wonder the main character Edith Cushing (Mia Wasikowska) -once grown up- has become a great writer of ghost stories. But for a women in 1900 getting recognition for it proves to be very difficult. The only one who does acknowledge her writing talent is Thomas Sharpe a british engineer seeking financing from her father for his latest project. Thomas is played by Tom Hiddleston who’s reunited with Wasikowska after ‘Only Lovers Left Alive’. Once the father -who was opposed to them getting married- gets brutally murdered they end up together with sister-in-law Lucille Sharpe (a great Jessica Chastain) in a gothic castle called Crimson Peak. The film’s look is lavishing. The Oscar race for best costume and production design seems to have already been run before the line-up is known. Especially the first half hour reminded me a lot of Scorcese’s ‘The Age of Innocence’. Perhaps the name Edith Cushing has been derived from Edith Wharton (writer of a.o ‘The Age of Innocence’ and ‘The House of Mirth’) and Peter Cushing (the legendary actor of many a Hammer studio horror film). The film is a real visual triumph, an additional set of eyes would have come in handy to take in all the visual details on display. The superimposed ghost effects in the Autant-Lara were as good as you could get in the mid forties and are still looking great unless you wish to be blasé about it. 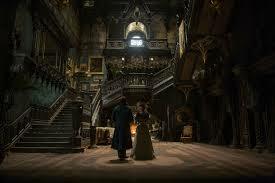 The ghosts in ‘Crimson Peak’ are digital and less friendly but once they are up close and out of the shadows they look less convincing and thus less threathening then they were probably intended to be. The real effective shocking moments -which are sparsely used- are being achieved by sudden unexpected outbursts of violence, less shocking then in ‘Pan’s Labyrinth’ however. There are some wonderful poetic moments of horror, the scene of ants eating a butterfly being the one that comes to mind first. Although for most of the film I was having one of the most magical movie experiences of the year the film did not end up to be completely satisfying. Del Toro knows the history of gothic horror stories like no one else but the film is perhaps more eye candy than the self professed eye proteine. Where his previous ghotic films were set during the spanish cival war the more romantic setting here provides for less of a sense of urgency. In short, the films has less of a (Devil’s) backbone. As far as references are concerned there are at least 2 nods to ‘The Shining’ and the ‘Enola’ ghosts has a color scheme identical to that of ‘Hellboy’. The name Enola off course reminds us of Enola Gay although there’s no further sign in the film that the future dropping of the atom bomb is being hinted at. < Previous On the air + Back to Cinematek: The ghost of Jacques Tati. Next > R.I.P. Maureen O’ Hara (1920-2015) – E.T. likes Maureen.